Now that the bonding for the new Longmeadow High School has been completed, a more accurate projection of increases in future property taxes can be made. 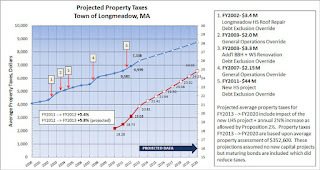 Using financial information recently obtained from Longmeadow's Director of Finance, I have updated my previous projections of Longmeadow property taxes for 2013--> 2020. 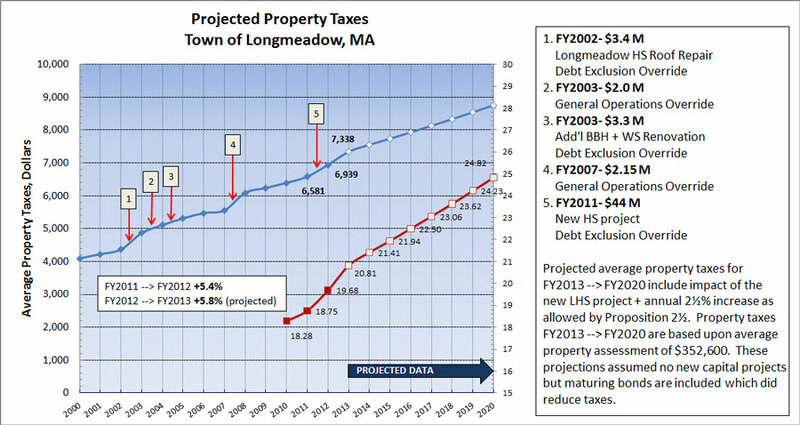 These latest projections include future effects on property taxes for all of the outstanding capital projects (Proposition 2½ debt exclusions) that have been approved by Longmeadow taxpayers. They include the impact of bonds for the new LHS project + the annual 2½% increase as allowed by Proposition 2½. Maturing debt was considered which did reduce taxes. Property taxes FY2013 --> FY2020 are based upon average property assessment of $352,600. FY2012 property taxes increased an average of +5.4% from FY2011 and FY2013 property taxes are projected to increase another +5.8% over FY2012. The above property tax projections for FY2013 --> FY2020 do not include any new capital projects such as a new DPW facility or upgrades to the two middle schools. These projections also do not include any borrowing related to the recent tree debris cleanup costs. These projections assumed no Proposition 2½ operational overrides until after 2020. Given the above assumptions the average property tax will increase from $6939 in FY2012 to $8752 in FY2020- a 26.1% increase. Please note: Residents should multiple the current FY2012 mil rate (19.68) x current assessment (see Vision Appraisal website) to determine their FY2012 taxes. 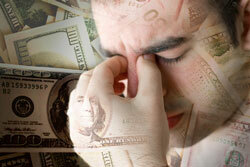 Remember, you cannot simply multiple the current 3Q tax bill (due Feb. 1) x 4 to obtain your FY2012 taxes. The Select Board and School Committee are now engaged in FY2013 budget discussions. It will be interesting to see how our elected officials meet the upcoming budgetary challenges. Stay connected to the Buzz blog for updates throughout the budget season.